I have been thorough in examining Judge Kavanaugh’s record. And while the recent allegations against him are troubling and deserve a thorough and fair examination by the Senate Judiciary Committee, my decision is not based on those allegations but rather on his positions on several key issues, most importantly the avalanche of dark, anonymous money that is crushing our democracy. He has revealed his bias against limits on campaign donations which places him completely out of the mainstream of this nation. He wrote, ‘And I have heard very few people say that limits on contributions to candidates are unconstitutional although I for one tend to think those limits have some constitutional problems. Going even further, Judge Kavanaugh will give free reign to anonymous donors and foreign governments through their citizens to spend money to interfere and influence our elections with so-called ‘issue ads.’ These ‘issue ads’ are now flooding the airways in this nation to directly influence election outcomes, drowning the concept of individuals having the strongest voice in our democracy. Judge Kavanaugh has clearly said that there should be literally no restrictions on these ads. He has called restrictions on these dark money issue ads ‘blatantly unconstitutional.’ And in a court opinion, he went out of his way to say that foreign nationals weren’t restricted from creating or contributing to these ads – even when that wasn’t the issue before the court. A Russian company that has been indicted for election interference is currently using Judge Kavanaugh’s opinion to argue for their innocence. 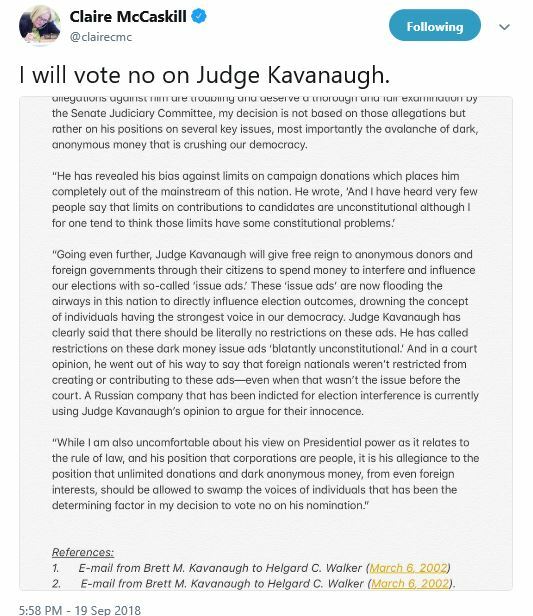 While I am also uncomfortable about his view on Presidential power as it relates to the rule of law, and his position that corporations are people, it is his allegiance to the position that unlimited donation and dark anonymous money, even from foreign interests, should be allowed to swamp the voices of individuals that has been the determining factor in my decision to vote no on his nomination. Right. 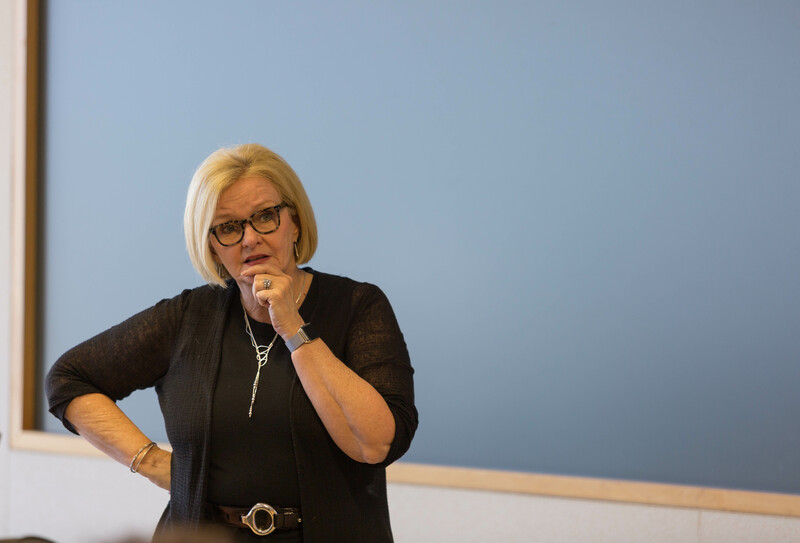 Claire McCaskill (D) was Jackson County Prosecutor from 1993-1998 – and was an assistant prosecutor in the office before that. A prosecutor. Contemplate that for just a moment. The calls to campaign offices by potential campaign volunteers just spiked.